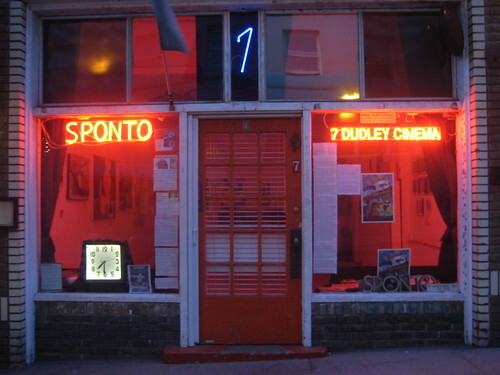 Did you know that the Sponto Gallery (nee Venice West Cafe) is threatened? The owner, Mark Sponto, recently died. The place started out as a bleach factory in the 1920s, but by 1956, the place was empty and abandoned. Poet Stuart Z. Perkoff was squatting in the warehouse when he hooked up with bookshop owner John Kenevan to get the lease and renovate the place. 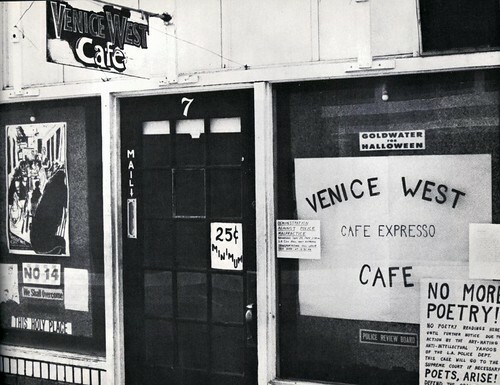 They turned it into L.A.'s first European coffeehouse in 1956 -- the Venice West Cafe. 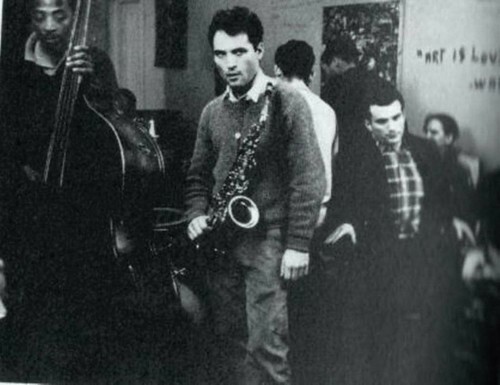 Now, William S. Burroughs, Jack Kerouac and Allen Ginsberg were all published by 1956, but there was no "Beat" scene per se. As in, there was no center-of-the-universe for post-WW2 bohemian culture just yet. Kenneth Rexroth was championing the San Francisco writers during the first half of the 1950s, while Lawrence Lipton was championing the Venice poets during the same period. Rexroth called them "Beats," Lipton called them "Barbarians." Rexroth was a lauded poet, Lipton was a pulp novelist. Who won out? Rexroth. But I still think that the Venice poets are just as vital to the history of bohemian culture in America and in Los Angeles, especially. It all started there... There's no Doors, Love, Zappa, Byrds, et al without the Venice West Cafe. 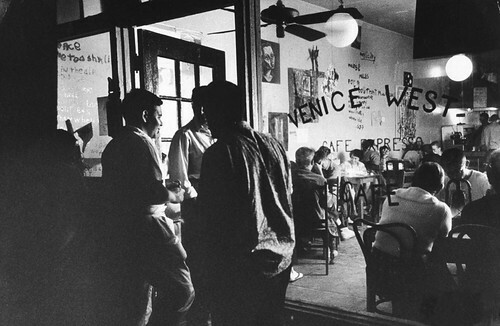 Wallace Berman, who published "Semina," started out of the Venice West Cafe. It was a magical, wild and colourful place. Brian may be at the next ModCom meeting January 20th. Come and hear his pitch for this building. 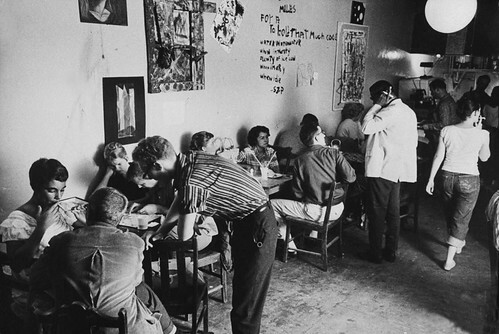 Published caption:	CONTEMPLATION-A beatnik sips coffee at last Venice refuge. Phys. descr. :	1 photograph : b&w negative ; 5 x 5 cm. Source:	Los Angeles Times photographic archive, UCLA Library. Copyright Regents of the University of California, UCLA Library. THURSDAY, SEPTEMBER 17, 2009, 10:00 A.M. The former Venice West Cafe, headquarters of the L.A. beatnik scene and gathering place for the Doors' Jim Morrison and Ray Manzarek, could be designated a city historic-cultural monument. ...Los Angeles Cultural Heritage Commission is expected to decide today whether to recommend that the site be designated as a city historic-cultural monument. The low-slung building holds great value as a local symbol of the bohemian spirit of the mid-20th century, says Alan Leib, chairman emeritus of the Los Angeles Conservancy's Modern Committee. Venice West passed the commission unanimously this morning. Are there any documentaries on the Venice Cafe...?